Before becoming a vegetarian I used to LOVE Tuna! Tuna sandwiches, tuna on crackers, I used to snack on tuna all of the time, but after changing my diet to a more plant based one I struggled to find a replacement for my beloved healthy snack. That is until I discovered the idea of making a chickpea tuna sandwich. I’ve tried a few recipes (Thug Kitchen has a great one! ), but keep going back to my old favourite way of making it with a simple swap of chickpeas for the tuna. You can make this recipe as fancy as you want with extra sandwich toppings, or do what I do, and create your old favourite tuna sandwich with the simple swap out. The trick to making this sandwich is to mash the chickpeas. That, along with adding a bit of extra salt compared to what you usually would helps to give it a mushy salty taste that is somewhat familiar to a tuna sandwich. I also recommend dicing the onions and celery small. They add a good crunch, without overpowering the sandwich. All of my friends and family that are looking for a tuna sandwich replacement have really enjoyed this recipe, and I’m sure you will to! Even if you’re not a vegetarian or vegan, it’s great to continuously remove processed foods out of your diet and to eat meat free for a meal or a day of the week. Place rinsed chickpeas in a bowl and mash with a masher. Add remaining ingredients and mix together with a fork. Split chickpea tuna salad into quarters and spoon onto 4 slices of bread. 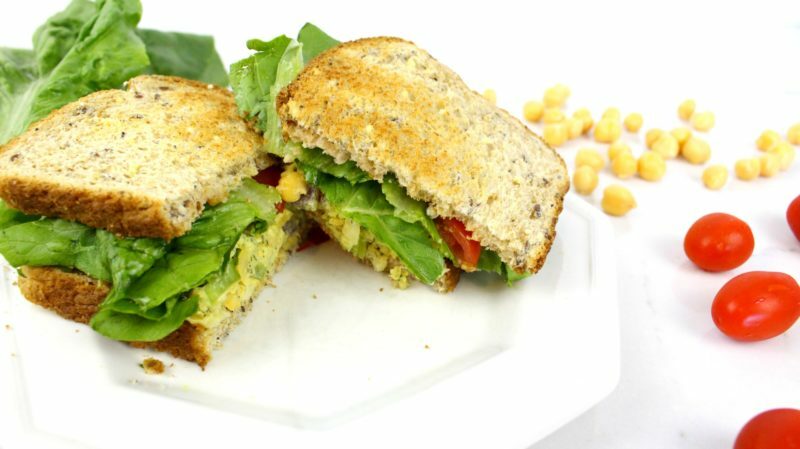 I love this chickpea tuna sandwich recipe, thank you Jannine for sharing it!